Line highlighting can be easy if you take a few steps in the beginning and set yourself up for success. Part of it is knowing what to do before you get to the highlighting stage and the other part is taking your time once you get there. That's not to say it will take you forever to line highlight a model, but as with any aspect of painting, it takes some time to get really nice results. Sure, your bigger models will take longer and if you're sloppy, you'll have to go behind and clean it up. But... the end result is definitely worth it. Aside from paints, there is one thing you really do need to have. That's a good quality paintbrush with a fine tip. If you find yourself sitting there trying to think if you have any of these in your collection... you don't. 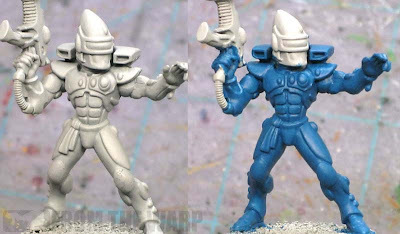 And if you think you can use your basecoating brush to do your fine highight work, you can't. You really ought to pick up a better quality brush, take good care of it and use it for this purpose only. Once you have a good one, you know you've got it. It might seem a bit much, but having a good brush to do this will make it easier. Believe me, trying to do this with an old brush with a bad tip will only cause you more problems than it's worth. I have my views on what constitutes a good brush and I recommend folks look around and find what works best for them. Here's the process I went through to find a good brush. I'm not going to get into paint consistencies other than to say you can thin your paints to the point you feel comfortable working with them. I do it slightly with most of mine. Notice I said most of mine as I have some paints I don't thin at all. It all depends on what color/brand I'm using. This is a personal preference thing. What thinning really does to your paints is make them flow off the brush and onto the model a bit easier and you don't have to press down as hard on the model with the brush to get the paint onto it. It will take some experimenting on your part to find what paint "consistency" works best for you. Now what kind of shading should I do? What do I need to do before I line highlight? Basically it comes down to getting your model ready. Priming, basecoating and shading. Those are what you need to have done. For me, line highlighting is the final step. 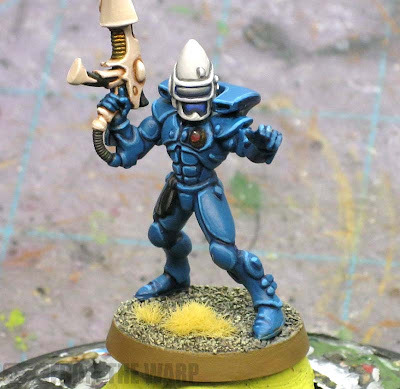 In my example here, I've used an Eldar Guardian since he has quite a few armour plates for me to practice on. Once your model is ready, you'll have one of two situations you'll be faced with as you start your line highlighting. It will depend on how you shaded your model that will determine what you're faced with. Why does this matter? Because ideally we'd like to be able to go behind our work and clean it up as needed to get the best effect. Depending on what you did up to this point, it could be impossible or it could be a piece of cake. If you've covered the surface or section to be line highlighted with a wash or any effect that has darkend the entire surface and created subtle variations in surface color, you'll have a difficult time cleaning up your work. You won't be able to go back with your basecoat and clean up any mistakes you make while highlighting without seeing your attempts to fix your mistakes. Look at the photo above, on the left, you can see the highlight along the edge and where I made a mistake. On the right, you can see where I tried to fix it with the base color. It ends up looking like a thin highlight with a fat line next to it. ... you'll be able to make corrections as you line highlight your model. How do you make corrections then? You make corrections to your line highlighting by going back in with your original basecolor and cleaning up any stray marks or painting along side your highlight in order to make it even thinner and more crisp along the edge. 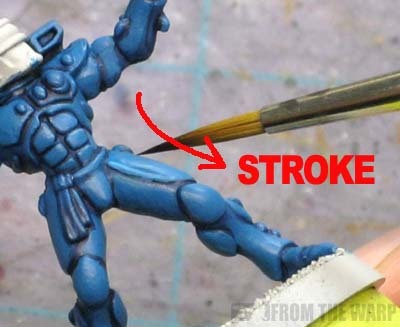 This works if you've kept your shading to the recessed areas only or already went back in and repainted your base color so you're highlighting on a consistent colored surface. In some cases where you have the subtle variations across a surface and you make a "mistake" while line highlighting, you can erase your mistake if you quickly rinse out your brush, leave a little excess water in it and then try to wipe or scrub away the stray mark. This will work most of the time. Of course it won't work on that one character model you've got a hundred hours into if you're anything like me. But how do I paint my line highlights in the first place? 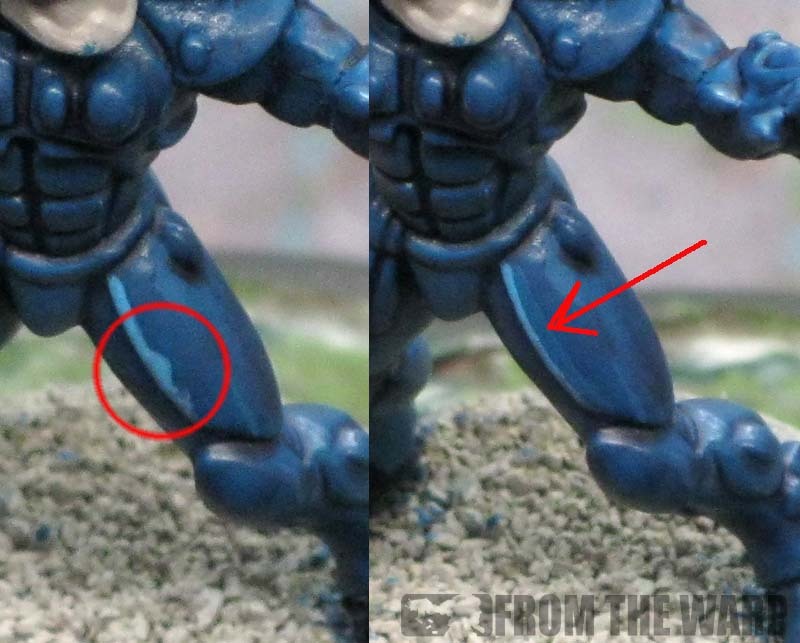 When it comes to painting your line highlights, you want to make sure you do a couple of things. 1. Do NOT load the brush up to the very top of the bristles with paint. I use very little paint on the very tip of the brush and after a few strokes, I rinse out my brush and start over. This keeps the paint from drying in the tip of the brush and making my lines too large. I always start away from me and pull back towards me. Do not try and push the brush to the left or right or even worse... away from you. You want to be able to apply a consistent pressure (to keep the line the same thickness) and pull it towards you for a smooth line. 3. Hold your brush at the "proper" angle. This is perhaps the biggest thing. How you hold your brush matters. You want to "pull" your brush along the surface and not stab or poke at the model. We want to be able to apply a slight amount of pressure (like normal) and drag just the tip of the brush along the edge we want to highlight. 4. Don't try to do it all in one pass. This ties in with the first part. We aren't going to line highlight the whole model in one go. It will take a number of smaller strokes. In the photo above, you can see the starting points for each stroke (the dot) and the direction the highlight is pulled. Remember to hold your brush and the model so that you maintain the correct angle as well! You can see that by repainting the armour plates with the base color (or limiting my washes to the recessed areas only), I can go back in with my original base color and clean up my stray marks. It took a bit longer to do the model like this since I had to apply my wash carefully and then clean up the armour before highlighting, but the look is much more "finished." Here you can see the gun has been given the same treatment as the armour. It started as a base of GW Dheneb Stone. I carefully applied a GW Ogryn Flesh wash to the recessed areas only. After that dried, I went back with the base color and cleaned up the weapon. This gave me a nice, clean and consistent surface to apply my line highlights to. I took P3 Menoth White Highlight and went over the prominent edges to define the shape of the weapon. Even following the tips above, it's going to take some practice to get the feel for line highlighting. You'll get a feel for how much pressure you need to use, how long of a line you can put down in one stroke, where to start each stroke, etc. And the more you practice, the faster you'll get at it too. The first few times, it's going to add a substantial amount of time to your painting. After a while, it will get faster and it won't add much time at all. NOTE: Since it was mentioned in the comments, I did a follow-up post that talks about using the side of your brush to line or edge highlight and some of the things to watch out for when trying that technique. Thanks a lot for this Ron. I've just started painting my new Dark Eldar army so this is perfect timing! Having gotten away with a quick and dirty base-wash-drybrush on my space wolves I'm finding it frustratingly slow but it's good to know that other people make mistakes with it and have to correct them!! Above all I think the important quality I lack is patience. That and time since I've got to get 1750pts done for December! Thanks again for doing this! Exactly what I was hoping it would be. Speaking from my experience, If I'm highlighting a sculpted model detail, such as the thigh plate in the tutorial, what i do differs from Ron in that it take care to use the EDGE of the brush along the raised detail to paint my line. The tip of my brush is mainly used to apply detail to flat surfaces, such as the eyes and any freehand. I've found that using the edge of the brush can also help. 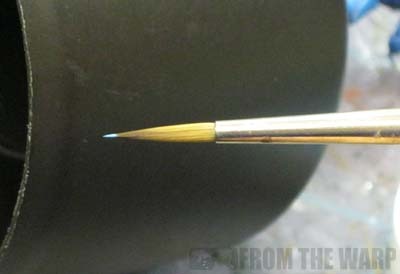 If you have a relatively sturdy brush, and the edges to be highlighted are raided enough that the tip won't hit the recessed areas it can really make things easier. Cleaning out the brush as you go has to be the top tip of the month. Impatient painters like myself try to use a loaded brush too long. When the paint dries the brush behaves differently. I really like this series ron! It always seems to be the simple stuff that trips me up. In this case going back over my washed models with the original base color. Makes perfect sense when you stop and think of it, something that I should have figured out my self long ago. Nice article thanks, and as I am just about to paint my Dire Avengers, very useful too. What colors did you use for the blue? It looks splendid! I wasn't going to mention the "side of the brush" thing in order to keep this real simple. Looks like it might help to touch on it though. I'll get something posted tomorrow explaining that approach. I'm glad this has helped some folks. 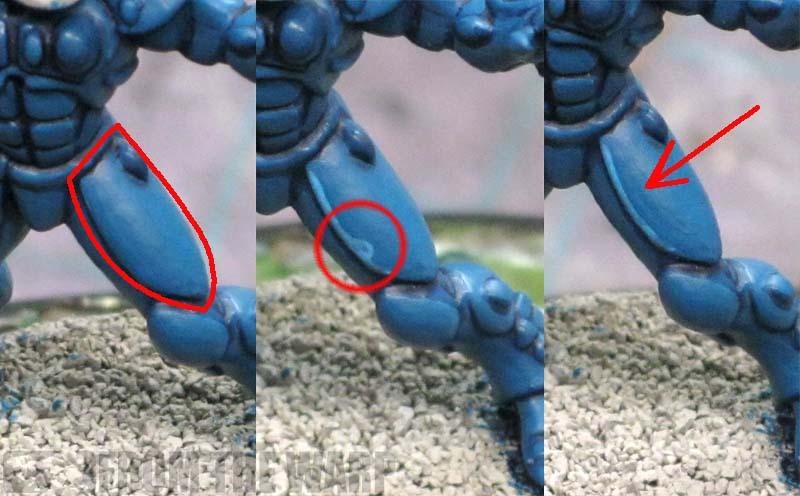 Anon: The blue is Hawk Turquoise with a GW Asurmen Blue wash in the recessed areas. The line highlight is a brand X color that I don't remember off the top of my head. Very informative post again Ron, particularly nice how you're emphasizing that mistakes can be fixed. None of us are perfect and over the years I've seen many starting painters freak out when they 'mess up' one of those expensive minis. Rule one for a starting or experimenting painter, at least in my book, would be 'Don't Panic!'. Some spot on tips there. 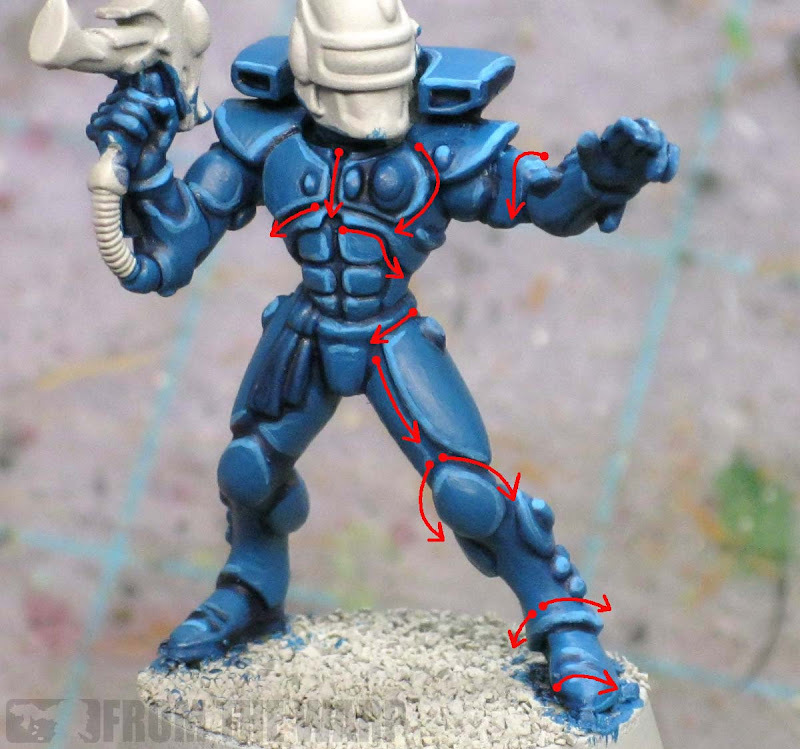 I'd also suggest using a line highlight colour close to your base coat. 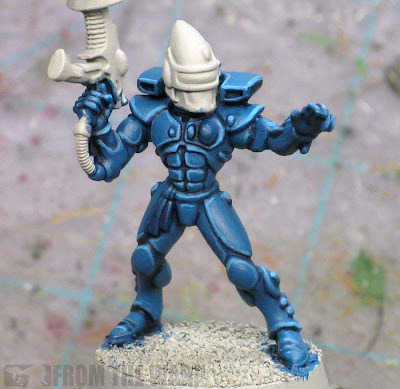 For example on a mordian blue basecoat I'd paint an ultramarines blue edge highlight, then ice blue and finally a small line of space wolves grey. By keeping the line highlight colour close to the previous layer you'll find it's more forgiving as its easier to paint on and correct. I'd also only do a bright highlight like the space wolf grey I previously mentioned on the most raised edges as they would catch more light. Spot on with this. I use this type of painting technique all the time. Nice write up. Great write up. To add to your comment on erasing any mistakes with your brush by washing it out and quickly scrubbing or wiping the wet paint off before it dries, I keep a second brush nearby (usually an older one) that I dont' care about the tip so much and keep it damp so I can quickly switch to it and erase any mistakes. Not having to rinse the brush I'm painting with gives less time for the mistake to dry and an older brush lets me get a little more violent with trying to remove the error. In my opinion, highlighting models is the only way to get something clear and clean-looking. I do three levels of edge highlighting for my Templars, and I use increasingly smaller brushes for each successive highlight. It helps in getting a smaller "rectangle" [read: line] in the previous rectangle both lengthways but also widthways, which makes it more subtle. I also wear x3 magnifying glasses when painting, so that helps with accuracy. I use the cocktail sticks, put a tiny bit on at the end, and highlight like that. It gives a nice effect, and I also use it for lights and small skulls on my BA. TheBleedin'Angel: I don;t know if I could do that. I like the feel of the brush and being able to apply just the right amount of pressure to get the line I like. But if it works for you, go with it! 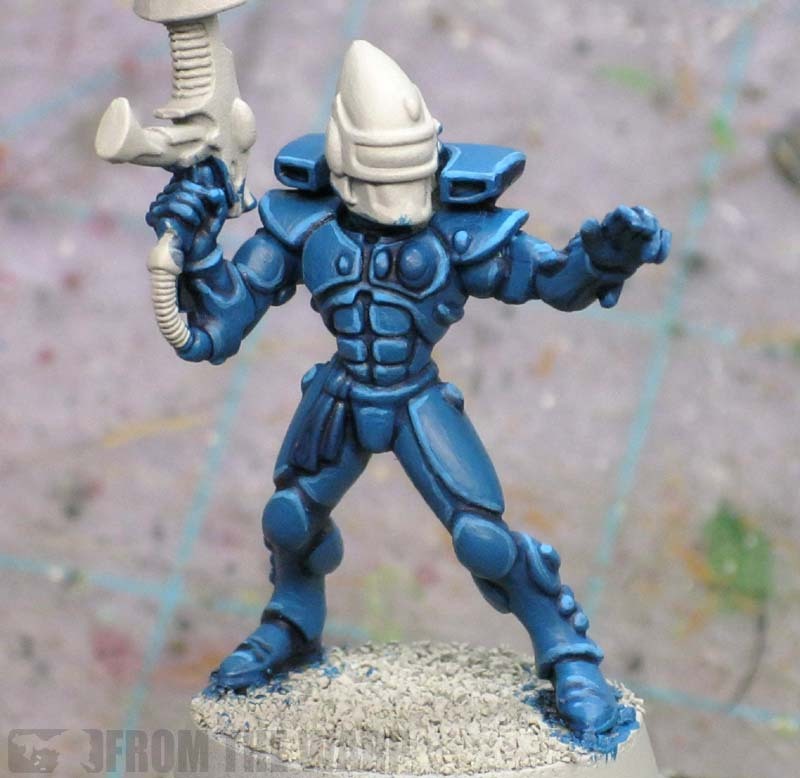 Wierd question, what craftworld is this model painted after? Thanks and great job! Anon: Yikes, I forget. It's in the back of the Eldar codex... all I did was copy a color scheme from there. Great guide. I'm using it as inspiration for my own Eldar! Would you mind going over who you did the white helmet please? I've always struggled with how to make white look good with highlights and such. It looks like you've done a recess "highlight" with a grey colour, or is that a wash? 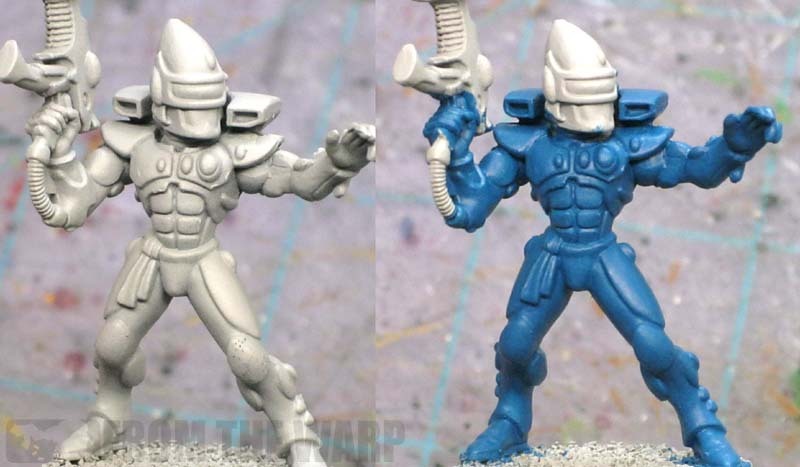 Anon: Sure, give me a couple days to put something together and I'll cover the 2 or 3 ways I go about painting white on models and why/when I use certain methods over others. Anon: The gun started as a base of GW Dheneb Stone. I carefully applied a GW Ogryn Flesh wash to the recessed areas only. After that dried, I went back with the base color and cleaned up the weapon. This gave me a nice, clean and consistent surface to apply my line highlights to. I took P3 Menoth White Highlight and went over the prominent edges to define the shape of the weapon.